How you like the new demo?? Well my thoughts are that it was a little EARLY to release this demo.As you can see it has some really disturbing bugs such as the chip pack bug and the attack+10 thing but no worries,it's all fixed now,at least that's what Max said to me! (GMT+1) probably but i'm not sure,which will contain at least 1 new virus and 2 new chips,AT LEAST.Oh and did you guys found the secret area in Demo+ yet? If not go and hunt that place down NAO!! Until my next update BAIZ!!! EDIT:I saw the most of you guys have problems crossing the red mettaurs at scilab so i made a save file for you.Just unrar it,overwrite it with yours and you can play from after the red mett fight. 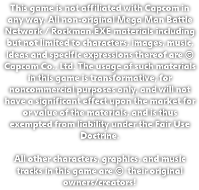 Hello Everyone!<br />MaxRock here,making a huge announcement!<br />I'm really honored to post this update due this is the update,everyone was waiting for.I need to thank you all for supporting our work especially the guys on the forum and the youtube posters,CAPCOM for giving us the inspiration to make the game with it's characters,and last but not least,our dear and awesome Developement Team!Thank you guys,this couldn't have been made without you all!<br /><br />We changed one thing in this demo.Well actually 2:<br />1:The demo wont be only a single,running exe.You need to download and install it with an exe so noone will get confused placing the music folder:D<br /><br />2:The 3rd demo is fused with Demo+.Yeah you heard it right.Once you play through the demo you'll be able to access Memento system,using the Navi Customizer,a access new area with new bosses to fight(althrough you must find this area by yourself):D<br /><br />Well i think that was enough,what else could i say?...Have fun!^^<br />==========LINK==============<br /><br />//////////////////////////////////////////////////<br /><br />P.S<br />Yea, I know, there should be more sound efffects. but you I just couldnt find them anywhere^^;; so ya, final version of game will have them:P<br />Right, also NC is not returning bugs in play yetXD<br />Also please ignore all grammar bugs in the game^^;;<br /><img border="0" align="none" alt="" src="http://mmbnchronox.22web.net/cutenews/data/upimages/blademan_pic.png"> MaxRock's out!